The proposed (red) tentacles of WestConnex Stage 3B (Rozelle Interchange) extend north from Parramatta Road beneath Camperdown, Leichhardt, Lilyfield and Rozelle, with ‘stubs’ linking to the proposed (orange) Western Harbour Tunnel under Balmain and Birchgrove. PISS OFF WESTCONNEX was applied to a hoarding on the derelict ex-Tigers premises [centre-left of this map, nr Iron Cove Bridge]. WestConnex – a controversial, fossil-fuelled and much-despised $20 billion largely-underground 33km tollway – is the largest infrastructure project in the southern hemisphere at a time of global climate crisis. Less than 50% complete, the project has devastated communities across Sydney’s inner west (e.g. St Peters and Haberfield) since 2015, and is now headed for our suburb of Rozelle. 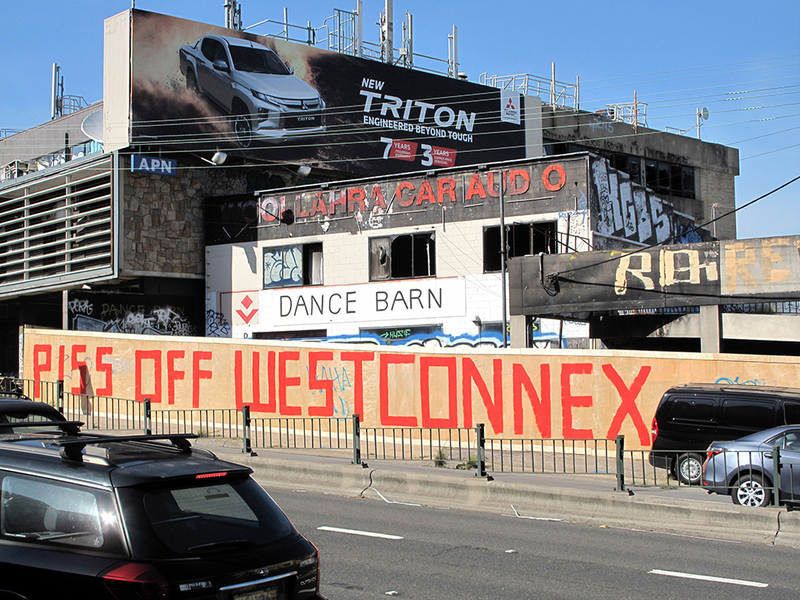 PISS OFF WESTCONNEX channelled our community’s anti-WestConnex frustration, impotence and anger in the lead-up to the March 2019 NSW election. The work, a collaborative, hi-vis public-protest (50,000 vehicles/day pass the iconic ex-Tigers site on Victoria Road, a major city artery) was imagined, plotted and actioned by Callan Street artist confrères Denise Corrigan, Mark Titmarsh and David Watson. It was completed only in the nick of time – David and Mark apprehended by highway patrol and subsequently charged by local police as they finessed the ‘X’. The work remained on view to motorists and pedestrians for a week until it was blacked out (a ghostly vestige still visible at night via passing headlights). On the day before the NSW election the artists pleaded guilty before a sympathetic local-court magistrate at Sydney’s Downing Centre. No conviction was recorded. Applied to a temporary hoarding in front of the derelict ex-Tigers Leagues Club premises on Victoria Road, Rozelle on the evening of 25 February 2019, the work forms part of an ongoing local anti-WestConnex offensive. The premises are ear-marked for a gargantuan polluting ‘dive site’ (the size of a small mine, barely 30 metres from Rozelle Public School) to remove spoil for the proposed Western Harbour Tunnel (Stage 4 of WCX). Although described as ‘temporary’ the as-yet-unapproved acquisition would likely be for 10 years!